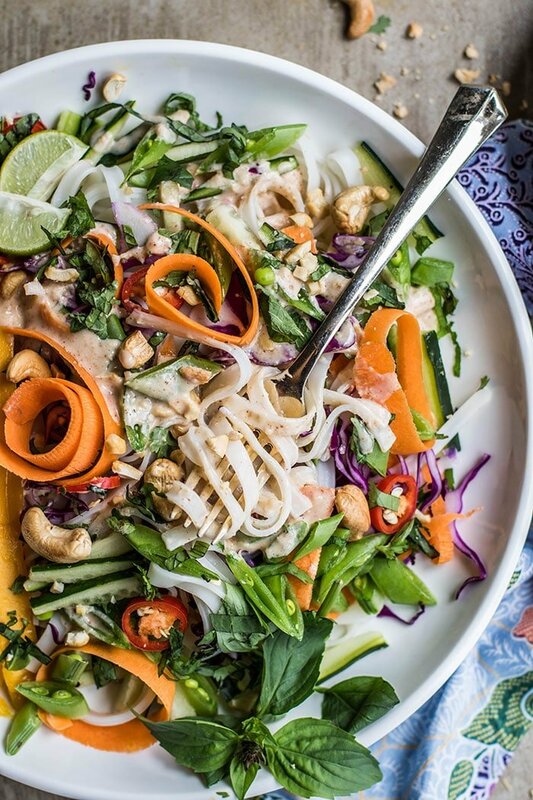 This Cold Thai Noodle Salad is a great make-ahead dish, and perfect for these hot summer nights! 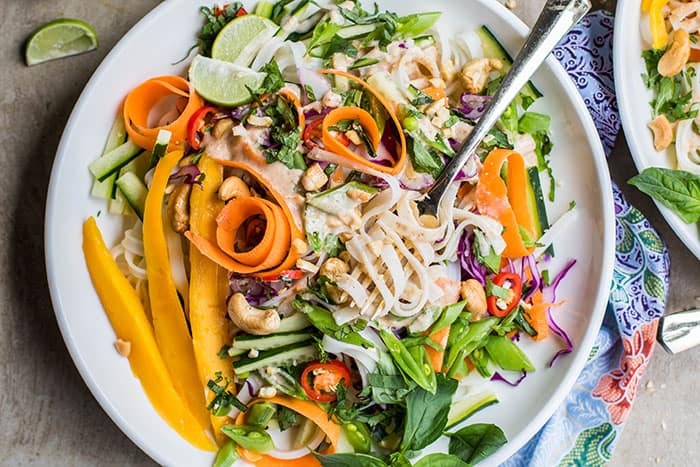 Naturally gluten free rice noodles, tons of crisp summer veggies, and a super flavorful Thai lemongrass and ginger dressing will have you coming back to this recipe again and again! Life has been busy . . . in the best possible ways. My son is turning 2 next week, and in an attempt to be the perfect Pinterest Mom, I have photos saved of all these adorble choo-choo train party ideas. And a bag full of art supplies sitting next to cardboard boxes I’ve collected, completely untouched since I brought them home. My at-home, blog-related-but-not-solely-my-blog business is taking off. This isn’t something I’ve talked about on the blog. but eventually, I will! And recently, we returned to Malaysia after several months spent with family in Oregon. I love getting to spend so much time at home, but having a toddler amplifies the effects of jet lag by about 20. Of course he never want to sleep when I do, and always wants to sleep when I have errands I need to run. Delicious cold noodle salad recipes are perfect for busy weeks. The dressing in this salad soaks into the noodles and veggies, and the lemongrass, ginger, and coconut flavors become more pronounced. I am a huge Asian salad fan. If you are too, maybe you’ve tried my Addictive Asian Cabbage Salad, or my Thai Almond Salad Dressing? This recipe is easily doubled, and then you have a cooling summer dinner, plus leftovers for a few lunches (score and score!). I left this salad vegetarian, but it would be delicious with leftover roast chicken mixed in. Or some spicy grilled shrimp. Whatever floats your boat. I would like my family to eat more vegetarian meals, which prompted me to leave this packed full of veggies, but with a bit of a protein punch from the cashews and almond butter in the dressing. Make it Ahead: This salad is a perfect meal prep option. It only gets better the 2nd and 3rd days! Make it Vegan: This is a great vegan meal with no modifications to the recipe. For the Family: Omit the chilis, or use less to make it a bit less spicy. My 2 year old actually likes some spice in his meals and tends to eat food better with lots of flavor. He ate this with the veggies sauteed a bit, and the noodles chopped up. This cooling vegetarian noodle dish is packed with crisp vegetables, sweet mango, and tossed with a creamy lemongrass coconut dressing. 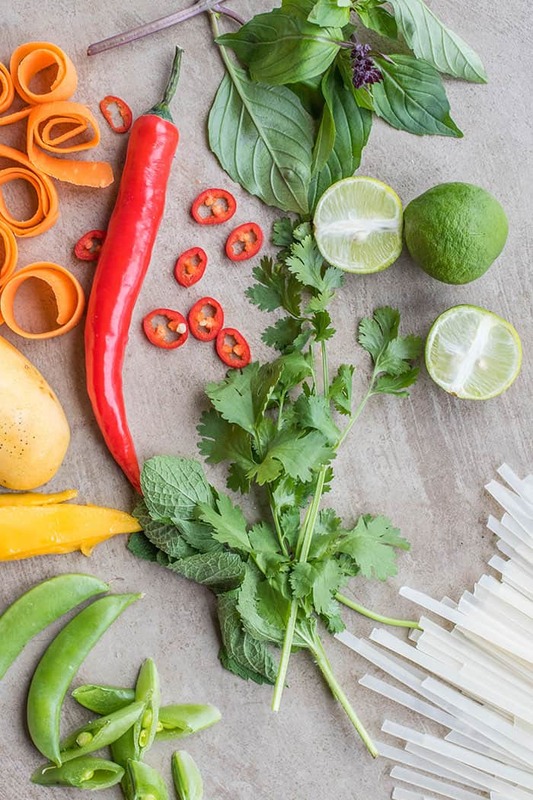 The perfect Thai inspired summer meal! Add all ingredients for the dressing in a blender, and blend for 1 minute, until all ingredients are mixed together well. Set dressing aside. Boil rice noodles until tender. Most rice noodle packages say to simply soak in hot water, but I have found boiling them over medium high heat works better to get soft rice noodles. When done, rinse with very cold water. 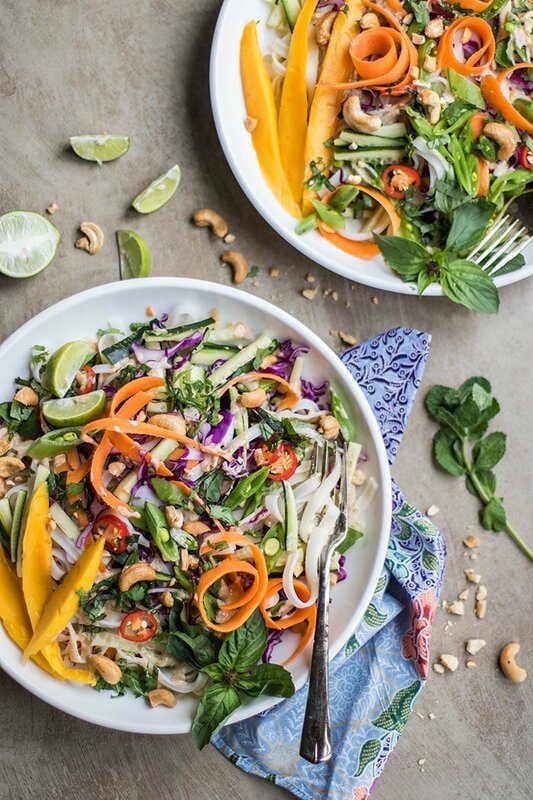 In a bowl, mix together rice noodles, chopped veggies and mango, and fresh herbs, and mix in the salad dressing. Garnish with more fresh herbs, chilis, and toasted cashews. Serve cold. This salad refrigerates great and the flavors intensify the next day. Thanks Rebecca :) You can't go wrong with all those Thai flavors! For the beautiful images I believe that this recipe is a delight, I will do and then I will step here to leave my testimony.